BREAKING! The Smart Meter Opt Out was ONLY an "Appeasement Plan" . . . The Goal: to halt the mounting opposition against the smart grid, and to - shut down natural gas use . . . yes, to shut down natural gas! “So if somebody wants to build a coal-powered plant, they can; it’s just that it will bankrupt them because they’re going to be charged a huge sum for all that greenhouse gas that’s being emitted,” he threatened. All federal agencies and private companies that deal with the U.S. government must identify their vulnerabilities to the impacts of global warming and develop a climate change adaptation plan, as per an executive order quietly signed by President Obama. We have discovered the smart meter opt out's are a distraction, extortion and ONLY an appeasement while the smart meter deployments continue nationwide . . and while we are distracted and not asking the right questions. The goal of the smart meter opt out was to halt the raising opposition and create the illusion that we had a choice. . we have learned we DO NOT HAVE A CHOICE . . .we have NEVER had a choice, period. Funded by the utility companies under the auspices of the public utility commissions, the Department of Energy and with White House directives along with stimulus funding, we were all FOOLED. . Private Corporations are taking over our cities and we are being systematically transformed into regional governments . . . Our futures are being reshaped under the name of sustainability. . We are not getting choices - we are being told what we can or cannot do by unelected officials in corporate agencies - and we have lost our local representative government. How did all this happen to us? Government Agencies have perfected the Rand Institute's Delphi Technique . . a technique used in "every" level on public meetings, every creation of public policy, every decision you think you make has been engineered by the Rand Institute. All the alphabet corporate agencies are under the mother corporation of USA, Inc., and we have all been socially engineered by predetermined outcomes and told we have been part of open public debate, and we have not. . . All the years that many of us in Northern California have invested at the CPUC meetings, speaking out against the smart meters, has been engineered for the advancement of the predetermined outcomes as determined by the mega corporations and the international bankers using the Delphi Technique . . .
Sonoma County and the other nine municipalities in Sonoma County, established one of the most aggressive GHG reduction targets in the state and nation by committing to reduce GHG emissions 25% below 1990 levels by 2015. This project was funded through an Energy Efficiency and Conservation Block Grant (EECBG) through the U.S. Department of Energy (DOE) and the American Reinvestment and Recovery Act. One of the goals of the EECBG program is to facilitate planning efforts and projects that will have a quantifiable effect on reducing energy use and GHG emissions while stimulating the economy and creating jobs. Facilitate energy efficiency upgrades and retrofits in existing commercial, residential, and industrial buildings by connecting residents and businesses with technical and financial assistance. Action 1.2.1. Connect businesses and residents with voluntary programs that provide free or low-cost energy efficiency audits and financing assistance for energy- efficient appliances. Action 1.2.2. Work with the Sonoma County Energy Independence Program (SCEIP) to offer low-interest financing and technical assistance to property owners for energy efficiency retrofits. Encourage	existing	development	and	require	new development to utilize PG&E's Smart Meter system to facilitate energy and cost savings. Action 1.3.1. Require new construction and major remodels to install real-time energy monitors that allow building users to track their current energy use. Action 1.3.2. Inform the community of metering options, such as online applications and in-home monitors. Action 1.3.3. Connect businesses and residents with rebate programs that give priority to appliances with smart grid technology. Facilitate the efficient use of energy for appliances in residential, commercial, and industrial buildings. Action 1.6.1. Seek funding sources to develop a rebate program for residents and businesses to exchange inefficient appliances with Energy Star certified models. Cost estimates in the "Energy Action Plan" in San Gabriel to retrofit the average residence is $2,000 to $5,000 per household . . . These plans discuss how increasing taxes, getting grants (bribes), structuring retrofit home mortgages to meet the costs requirements to implement the GHG reduction commitments agreed to by your city, for you. . .household and business monitoring programs will enforce the "required" reduction of resource use. . A third party energy manager will conduct monitoring, annually, to verify target GHG reductions are being met by the cities. Keep in mind the partnerships are Private Public Partnerships . .
Read the "Report from Iron Mountain" which is an agenda that was implemented that tells us how pollution was INVENTED and advanced by NASA to create the FEAR necessary for the Global Banking Cartel to maintain "control" of society. . created pollution - intentionally! “Imposing such controls by executive order seems merely designed to prevent the American people from finding out the truth before the policies are implemented," he said. "Obviously, the ... report is silly." Note: Some of the supporters of the Presidential Climate Action Project are the Rockefeller Brother Fund and Rockefeller Family Foundation - the Rockefeller's were on the ground floor and worked with Harvard College along with the United States Air Force back in the late 1940's to create the silent weapons system to gain "total" CONTROL of the civilian population. The Operation Research Manuel is a Declaration of War against the civilian population by a group of persons in position of great power and without full knowledge and consent of the public. Please read the "Silent Weapons Quiet Wars"
Continue to read the following excerpt taken from the link provided below . . .
An enormously valuable National Advisory Committee has supported the Presidential Climate Action Project (PCAP) over the past four years. Its members encouraged us to push the envelope of public policy in light of the urgency of global climate change, and they agreed that consensus would not be required, since consensus seeks the lowest common denominator in group work. Special thanks goes to Gary Hart and Ray Anderson for their co-chairmanship of the committee. The project was the brainchild of Dr. David Orr of Oberlin College, who continues his cutting-edge leadership in the field of sustainability. PCAP was administered by the University of Colorado Denver School of Public Affairs during its first three years, and by Natural Capitalism Solutions in its final year. Thanks to Deans Kathleen Beatty and Paul Teske and to Hunter Lovins, the president and founder of Natural Capitalism Solutions. PCAP has been funded by a variety of individuals and foundations. The project simply would not have been possible without each of them. Adam J. Lewis; Michael Northrop and Jessica Bailey of the Rockefeller Brothers Fund; and Ray Anderson and Mike Bertolucci at the Interface Environmental Foundation have been stalwart supporters throughout. Additional support came from the Sydney E. Frank Foundation, Tom and Noel Congdon, the Crown and Kunkler Family, the Arntz Family Foundation, the Krehbiel Family Foundation, John and Laurie McBride, the Rockefeller Family Foundation, the Bermingham Fund, Susan Sakmar, Rutt Bridges, Tara Trask, and Betsy Taylor. The Johnson Foundation provided invaluable support by hosting five conferences in which groups of national experts conceptualized and informed PCAP. April Bucksbaum, Scott Bernstein and Jane Elder contributed significantly to the content of this final report. Jennifer Lukas helped enormously with research and proofreading. PCAP has received ideas, advice and general intellectual support from hundreds of thought leaders and foot soldiers in the green movement in the United States and in Europe. In our 2008 report, we tried to list all of them to that point. We abandoned the effort in subsequent reports because contributors were simply too numerous to mention. But they know who they are, and we hope they know how much we appreciate their help. We’re grateful, also, to John Podesta and Todd Stern who as leaders of the Obama transition team sat down with us shortly after the election in November 2008 to go over our recommendations. We also thank the many people, from Nobel Laureates to school children, who signed two of PCAP’s foundation documents: the Wingspread Principles on the U.S. Response to Climate Change and the State of the Climate Message. BIG NEWS - This is in Chapter 4-10 of the Santa Rosa Climate Action Plan . . . Encourage residents and businesses to switch natural-gas- powered appliances to electric power, where appropriate. Action 1.7.1. Utilize the energy-efficient appliance rebate program to facilitate the replacement of natural gas equipment with electric-powered equipment. Action 1.7.2. Identify opportunities to implement additional programs that will switch appliances from natural gas to electricity. Did you know there are NO Energy Star Gas Appliances? Did you know that the "Climate Action Plans" or the "Energy Action Plans" ALL Require Energy Star ELECTRIC Appliances? Did you know the cities Action Plans say Natural Gas and Coal are Non-renewables? Did you know residents and businesses are to switch from natural-gas powered appliances and equipment to electric power? Did you think about why electricity ONLY? Of course this allows for greater "control" and restricts our choice of energy resources allowing for greater monitoring, higher costs and restrictions . . The city action plans "require" all new construction to implement smart meters and Energy Star Electric Appliances and Equipment. Did you know BIG OIL Companies are shutting down coal and eliminating natural gas use? This is a battle between the international banking cartels, and we are caught in the cross fire. .well not really. Actually, the international bankers plan for us is in the "Silent Weapons Quiet Wars" agenda which discusses slavery and genocide. The smart meter radiation is only part of the bankers silent weapons system to reduce the middle class, which the elites claim is a threat to their sovereignty, and to eliminate the majority of us for easier herd management. We are being farmed and harvested as "cattle" - you will read this in the "Silent Weapons Quiet Wars". Did you know that homeowners will be "nudged" at first to retrofit their homes and businesses with GHG reducing smart meters and RFID chipped, Energy Star Electric appliances? If nudging doesn't work then mandatory polices will be put in place . . Ever wonder WHY our aging underground gas pipeline system is NOT being repaired? Lack of pipeline repair is why those suffered and died in the San Bruno Gas Pipeline Explosion, providing the story of what occurred, is correct. Whatever the truth the story is gas lines blew up and we must fear gas lines blowing up under our streets in our neighborhoods . . . FEAR and media propaganda along with division and countless disinformation actors among us are leading us all into falsely created resource scarcity beliefs - which allow exactly what we all are witnessing with ever increasing toxins, lawlessness, no ethics or morals, more corruption and increasing danger to us all. So, gas pipeline FEAR has been created and when the utilities tell us we MUST all go to electric we will comply and NEVER wonder WHY! Ever notice how many street closures, in downtown San Francisco, occur that are due to underground gas line leaks? The gas employees were questioning management about why they were not filling the nearly 200 vacant job positions and why many excellent applicants were not be called back, much less hired. Management responded by saying they were planning to update the gas department with newer technologies and younger employees that were computer literate. That brought on a concerned debate with employees questioning their futures and the fact that management said they were an aging work force . . .The employees talked about a few resent young hires that were "completely" unskilled for gas work . . Most importantly, it was divulged that PG&E gas employees had not had any official company training for gas leak repairs. The employees said they learned by working with the older experienced gas crews. . . Management told the employees that they were qualified experts and not to forget that. • Sustainability is NOT the same thing as Zero Energy. 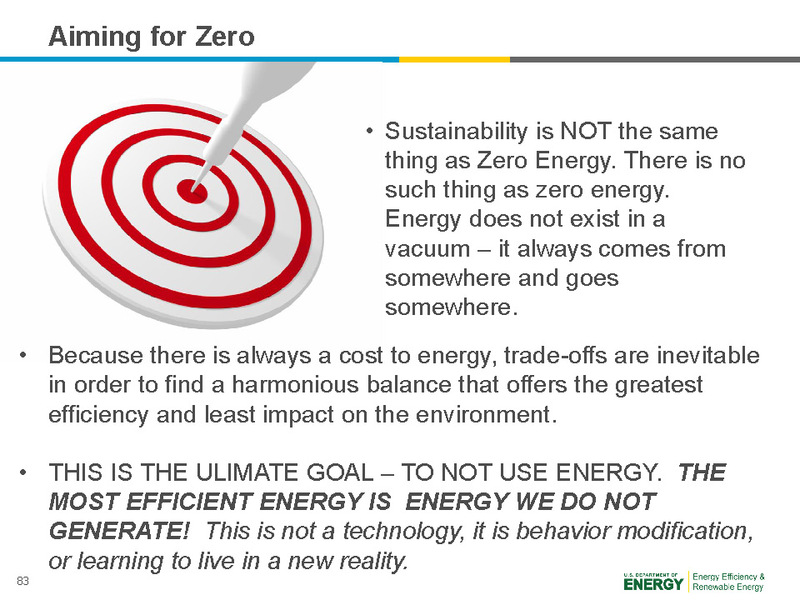 There is no such thing as zero energy. Energy does not exist in a vacuum – it always comes from somewhere and goes somewhere. •	Because there is always a cost to energy, trade-offs are inevitable in order to find a harmonious balance that offers the greatest efficiency and least impact on the environment. •	THIS IS THE ULIMATE GOAL – TO NOT USE ENERGY. THE MOST EFFICIENT ENERGY IS ENERGY WE DO NOT GENERATE! This is not a technology, it is behavior modification, or learning to live in a new reality. Find out if you have a regional planning association in your city or area . . Call your planning department and ask for the "Energy Action Plan" or the "Climate Action Plan". Do NOT comply or allow a smart meter on you home or business . . .
We are in a new reality of massive data collection and the Global Smart Grid is being stealthily "deployed" for the purpose of transforming every we do . . Here is yet one more article exposing the necessity of the 'system' to collect data. Go to StopTheCrime.net to learn more and visit the mind control link to see a new document . . called "Realizing the Full Potential of Government-Held Spectrum to Spur Economic Growth" - disturbing . . . The fate of mankind is under the direction of a ruthless monolithic conspiracy that has relied on covert means for expanding its sphere of influence - on infiltration instead of invasion, on subversion instead of elections, on intimidation instead of free choice, on guerrillas by night instead of armies by day. It is a system that has conscripted VAST human and material resources into the building of a tightly knit, highly efficient machine that combines military, diplomatic, intelligence, economic, scientific and political operations. in part by - John F. Kennedy . . .